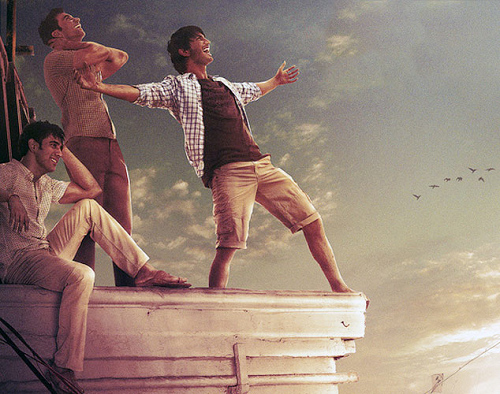 A tale of experiences of three unemployed buddies, ‘Kai Po Che’ is a film directed by Abhishek Kapoor (Rock On) from a Chetan Bhagat novel “The Three Mistakes of my life.” The actors are relatively newcomers, but perform credibly. The film is set against the backdrop of Gujarat during its earthquake and riot hit days. Through the film, I feel the director highlights the contribution of many unsung heroes, who do commendable work during difficult times and act as a great motivator in shaping talents and future generation, even though their existence is no better than a pariah shunned by family and society. One of the three principal characters, Ishant, detects a cricketing talent in a small Muslim boy in the neighborhood, and does his outmost to build and promote the budding cricketer. At the end, the talent is shown representing the National side, but sadly, his mentor didn’t live to see the happy day. He became a victim during the Gujarat riots, and falls prey to the bullets of his own close pal. Some sequences, such as the 3 buddies sprinting great distances during the earthquake to see their business venture startup come crumbling down appears rather contrived. The romance between one of the protagonists and the sister of the other, or the playful sequences of the three lead in the first half or the Garba dance sequences, provide some of the lighter moments and the warmth in the film. The camerawork has a lyrical quality, especially in the first half of the film.